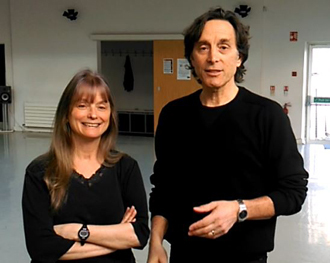 Artistic Directors Robert Connor & Loretta Yurick speak in studio about one of their programs, Well-Dance for Seniors. Bring joy & transformation to people's lives. Dance Theatre of Ireland is a professional contemporary dance company based in a beautiful purpose-built Centre for Dance in Dún Laoghaire, with extensive Arts & Health, Arts Participation, Educational Outreach and Performance programmess, working locally, nationally and internationally. Our beautiful Centre for Dance has some 1,500 people of all ages engaged in participatory dance activities throughout the year, and the Company delivers over 200 Educational Outreach workshops annually. With a very welcoming atmosphere, we offer opportunites for all ages to Learn, Create, and Perform. This is multifaceted full-time position managing DTI’s Participation programmes and Centre for Dance. The Centre & Outreach Coordinator works closely with the Artistic Directors and DTI team to manage our busy Centre for Dance programme of classes and our nation-wide Educational Outreach programs. The position involves managing the enrollment / attendance/ financial tracking and reporting of these activities, interfacing with classes’ participants and Outreach clients, liaising with DTI teachers, and a wide range of key relationships. This person is very active both in client facing and financial aspects. The position requires personable marketing, sales, management and communications experience in the arts, service or retail sectors, plus a high degree of financial and business acumen. A proven record of personable public client contact, ability to multi-task, think creatively, negotiate and administer to a wide range of key relationships are essential. Excellent keyboard and numeracy skills with a high degree of proficiency and fluidity in Word and Excel are required and competence in Adobe Photoshop & Publisher desirable. An appreciation of and/or experience in dance, arts in education and life-long learning are also important attributes. This is a wonderfully varied role for a succinct, sharp, and enthusiastic communicator. 3 years relevant experience essential. Please see DTI Spring Newsletter for an overview of our current activities. Dance Theatre of Ireland works with a range of creatively skilled professionals who are artists as well as administrative, management and production staff. If you are a dancer, video or digital artist, graphic designer, sound designer or composer, lighting or set designer, technical director, stage manager or production manager, arts administrator or accountant interested in dance, please feel free to contact us with your CV at any time.